WINTER IN CENTRAL AUSTRALIA IS BITTERLY COLD. HUDDLED IN THE LOW LIGHT OUTSIDE THE JAIL WE ARE WARNED OF THE STRONG AND EMOTIVE THEMES OF THE WORK: CHILD SEXUAL ABUSE, MADNESS, EMBODIED TRAUMA, DEATH. Ducking to enter through a small iron hatch-like door, I am disoriented; white manicured roses are shadowed red and pale blue under spotlights as I hear, for the first time, the ratchet sound that will haunt me throughout the performance. Good god, I think to myself, what the hell have I got myself into this time? 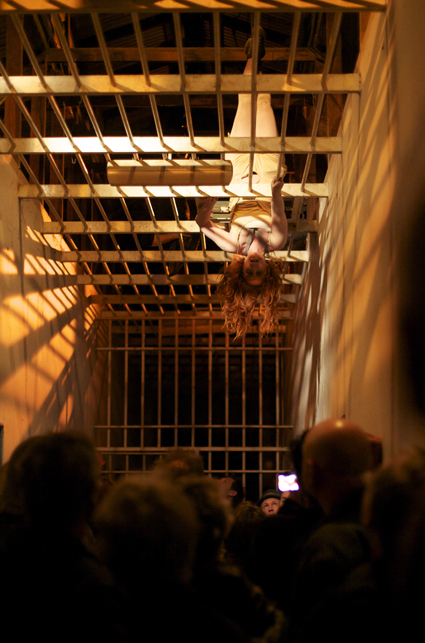 Set against the whitewashed walls of the cellblocks of the old jail in Alice Springs, Confined fuses physical theatre, multimedia installation and opera to evoke the distressing dystopia of psychosis. Creator and lead performer, Tammy Brennan, uses the archetypes of Echo and Narcissus to embody the split personalities of an adult survivor of sexual assault and her child self. The libretto traces her journey through the bowels of madness and despair, with the score interlacing live soundscapes with macabre field samples. The heart of the performance occurs in the claustrophobic corridors of two cellblocks. Here we are greeted by Echo, suspended from the ceiling in the moments after her death. Her long operatic howls ricochet through the corridor. The air is thick with sound and sweat as she is lowered to the ground to prowl amongst us, recalling gut-wrenching abuse in hyperbolic sprechstimme. Coloured lights emanate from closed cells, suggesting perverse peepshows of human grief. Across the hall a woman peers through the peephole into one of the cells. Compelled, I press my eye against one of the slits and spy a masked man, all protruding nose and sunken eyes. Later, the cell doors are flung open as Echo strides from room to room, oscillating between childish rage and sorrowful surrender as she encounters surrealist landscapes inhabited by live incarnations of her fragmented self. Another audience member brushes against me. My skin crawls. I am relieved when we are asked to move on. Entering the second cellblock, the sense of confinement is overwhelming as masked figures claw their way across the fenced gangway above us. Echo descends headfirst into the audience, her voice unwavering as she swings amongst us. The door opens. Suddenly, we are ejected into the crisp night air. The intensity of the cellblocks dissipates as we witness Echo’s ascent into another world. The spell is broken when we are herded into a small holding room to watch a gratuitous video interview with Echo recounting her abuse. Confined is an intimate and immersive foray into the depths of the troubled mind. While so much work produced in the regions mirrors the geographical and cultural nuances of local areas, Brennan refuses to ghettoise trauma in the local, undertaking extensive primary and secondary research to create a work that speaks to the universality of human suffering. From the burning ghats of Varanasi to the Hearing Voices conference in Melbourne, she has undertaken countless studies of site and numerous interviews with survivors of mental illness, including acclaimed outsider artist Anthony Mannix. Over a beer after the performance, a man confided that his brother had suicided during a psychotic episode, and that the show had been “a spot-on representation” of his brother’s world. By stepping outside the parameters of reality, Confined illuminates the profound terror of psychosis, that for some, is unbearably close to home.